If you are looking for a great evening in London, I highly recommend making a visit to Sketch London. My friends and I love to dine out and Sketch amongst other places in London was on our “Dine out” bucket list. 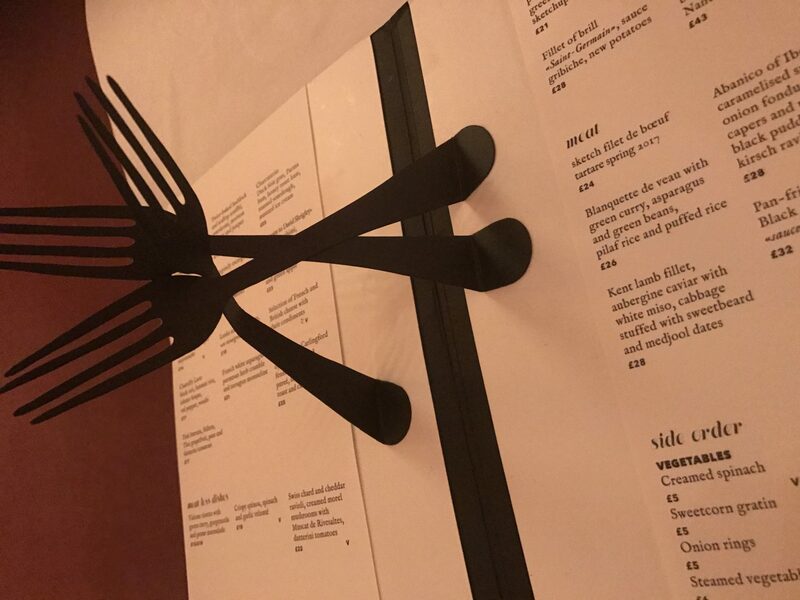 The restaurant celebrates the British artist David Shrigley’s work and his art covers the four walls in the restaurant. This was a great talking point throughout our meal, we noticed things that were perhaps somewhat peculiar, naughty and funny. We all have a great sense of humour so it entertained us hugely. As we entered the restaurant our eyes were drawn to the pink decor and rose gold bar back drop, silver cutlery and the stunning dome ceiling. We were taken to our seats and we were tucked in at our table (Yes, literally tucked in) by members of staff dressed to impress for sure and some even had quirky boiler suits on. I opened the menu and it greeted me with a mini surprise…although I won’t reveal all that happens at Sketch London it was a nice touch that made me and my friends smile. 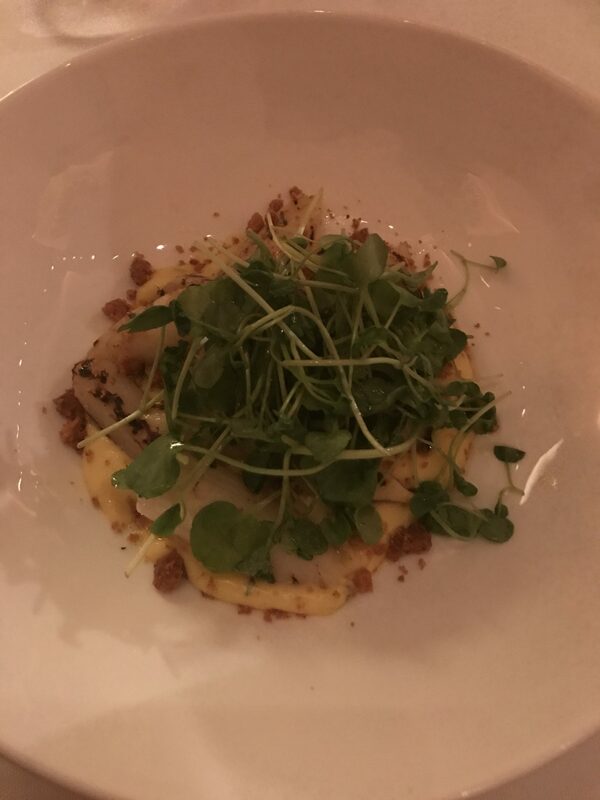 Considering I love food, make sure you have google ready as there were things on the menu that I didn’t have a clue what they were, so I went with easy choices like white asparagus to start which was absolutely delicious. It didn’t take too much time to arrive after we ordered. In fact, I can’t remember the time frame as I was enjoying the company I was with but it felt like it took no time at all. The main meal was equally delicious, I had Swiss chard and cheddar ravioli, mushrooms and tomatoes. Well, I was in food heaven thats for sure. Every mouthful was full of flavour. I wasn’t worried about the calories at the point of ordering so when in Rome we ordered extra sides. I did however get caught out by the condiments…Salt and Pepper pots became “Dirt & Dust” and also what came with those was a third pot of “Nothing” which after a few glasses of red wine it took me a while to work out why we had a pot of “nothing” at our table…Those little things make Sketch incredibly unique and intriguing. 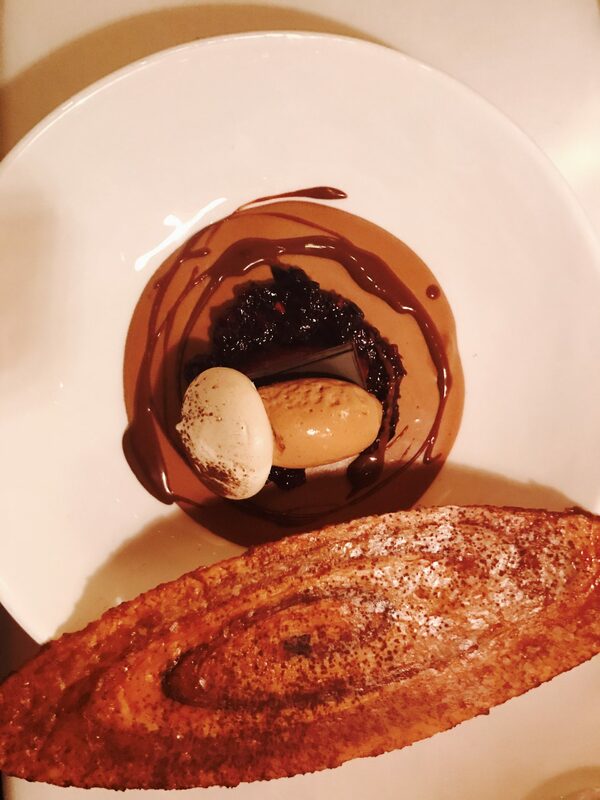 Finally the showpiece was my dessert…Sketch chocolate dessert. I was in my element and definately chocolate paradise. When we finished our meal the bottom of our plates told us so…you will understand when you visit. These little attentions to detail made it for me. You can actually buy the dinner sets which are show cased in reception. Yes, I am telling you about the toilets because these make the whole experience. The toilets became the focal point for our selfies and Instagram stories. We walked up stairs that are illuminated with spotlights along with Diptyque candles on every other step so it smelt amazing as we walked to the next floor. 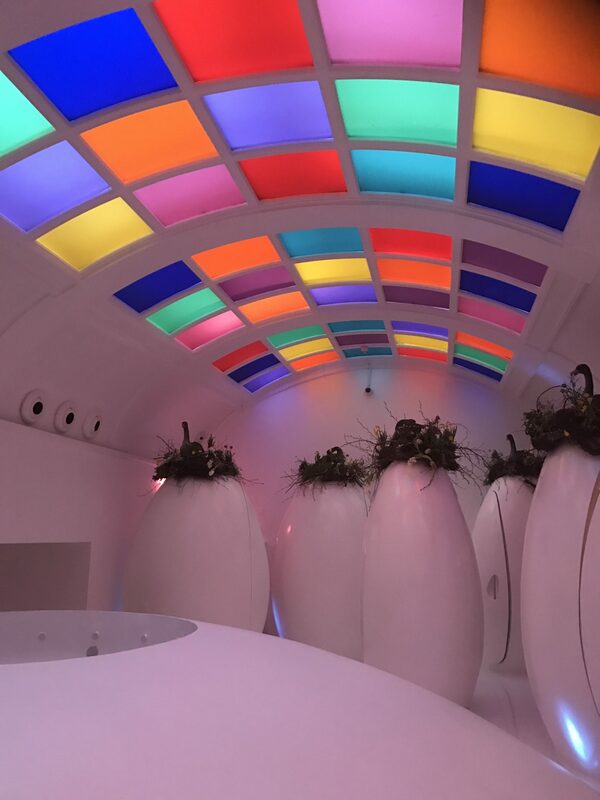 The toilets are somewhat psychedelic, large white egg pods, mens to the left and ladies to the right with a permanent cleaner dressed in black and white wearing a pinafore. That’s a very cool touch. The ceiling has bold almost like stain glassed effect panelled colours and due to it being Easter the egg pods have nests with birds perched on top. We made a few toilet breaks throughout the evening. I love art. The images and captions most certainly made me wonder what they all actually mean. We had a few moments throughout the dinner where one of us would say “oh, look at that one over there” or make a comparison to one and other using the artists captions. 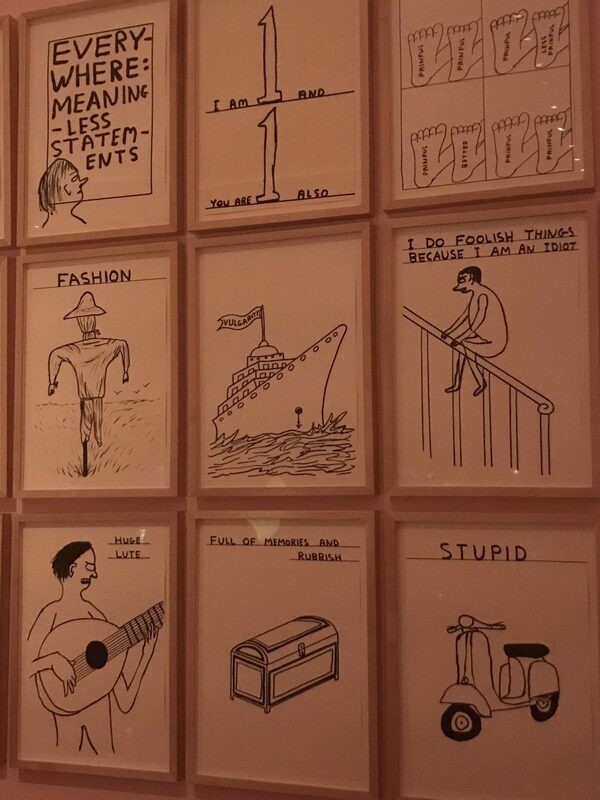 There are 239 pieces to admire and its the largest group of original drawings by the artist David Shrigley that he has ever exhibited. 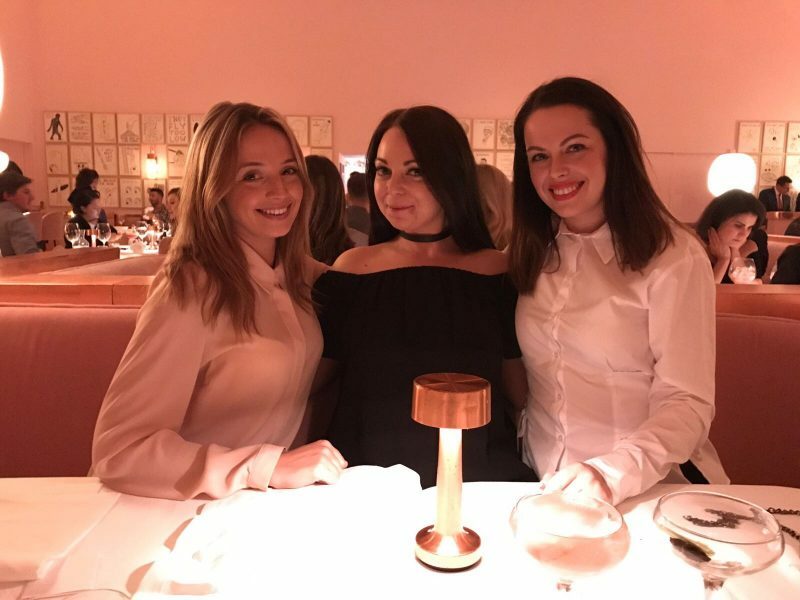 We throughly enjoyed our evening at Sketch London, the atmosphere, the food, the decor and the service was all pretty amazing. Most of all the company was the greatest. I would definitely recommend for an afternoon or evening out and they have a few restaurants not just the gallery. It can seem expensive but in return you are getting an experience. Thank you for taking the time to read and I truly hope you enjoy your trip to Sketch London as much as my friends and I did.